It’s not about celebrating defeat but being able to acknowledge, even in the haze of disappointment and frustration, that Palmeiras are evolving. In a nightmarish Brazil-vs-Germany-2014-World-Cup déjà-vu, Palmeiras allowed Cruzeiro to get two balls past Fábio early in the first half, before reacting, surprisingly well, and dominate for the rest of the game. The term “justice” is always inappropriate in sports, but Palmeiras did indeed deserve at least a draw against the current leader of the Brazilian championship. The weak spot, again, was the absence of a true playmaker; although many passes reached Diogo and especially Henrique, both blowing chances they are not entitled to blow. Watch the Palmeiras 1-2 Cruzeiro highlights and imagine three solid players arriving to reinforce, and you just might get your hopes up. “Three solid players arriving to reinforce”? you might sneer. “So, where are they?” True: if you solely hang on to president Paulo Nobre’s declarations in the media, not much give you the right to be optimistic. Nevertheless, reinforcements are arriving. Starting with Agustín Allione. The midfielder yesterday announced he’s on his way to Palmeiras. 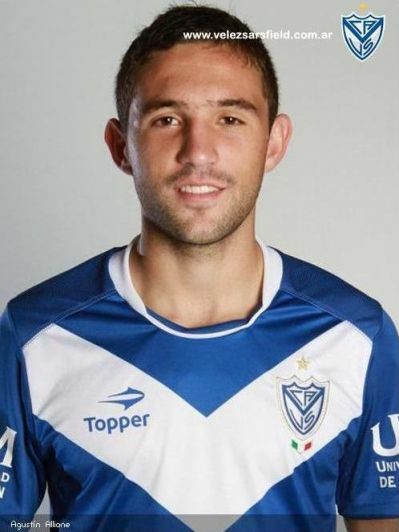 Vélez Sarsfield is letting the 19-year-old from both Vélez’s and the Argentine U20 national squad’s start ing eleven go for just under US$ 1.2 2.7 million. The kid is expected to sing a four-year contract with the Verdão and he’s excited about it: on twitter and facebook, he’s already expressing his expectations and thanking Palmeiras supporters for all encouraging messages received during the day. On the other side of the scale, Vélez supporters are profoundly lamenting he’s leaving: a good sign if any. If everything goes as planned, Gareca might be inclined to use Allione already on Sunday in the derby against Corinthians. But Gareca cannot focus on the derby quite yet, as Palmeiras tomorrow take on Avaí for the Brazil Cup. Lúcio, who on Sunday suffered a small fracture to his face after smashing it against the skull of Cruzeiro defender Manoel, is out; unless some kind of Jason-esque mask could be provided, he misses Sunday’s derby as well. Apart from Lúcio, all the squad’s main pieces are available but Gareca has opted for resting many of the players that were on against Cruzeiro, including Mendieta, Tobio and Wendel. In the training session before leaving for Florianópolis this afternoon, no less than eight players were different from Sunday’s starting eleven. Gareca has also promised more emphasis on set piece defence, as Palmeiras suffered goals both against Santos and Cruzeiro in that manner. Against Avaí, a victory is essential to boost confidence ahead of Sunday’s clash. In addition, a victory by a margin of two goals eliminates the need for a return game. You a palmeirense living in or anywhere near the state of New Jersey? You wondering how and where to watch the Corinthians vs. Palmeiras derby? Your place is at Casa Palmeiras! Traditionally, Palmeiras promotes events around Brazil called Casa Palmeiras (Palmeiras’ House), where fans can get together to watch important games, check out trophies, memorabilia and chat with former Palmeiras player. As part of the centenary celebration, Palmeiras are innovating and will host, for the first time ever, a Casa Palmeiras outside of Brazil. 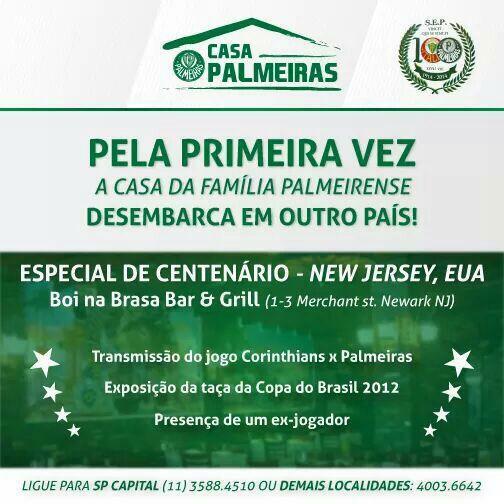 The event takes place in Newark, New Jersey, at the Boi na Brasa & Grill. Don’t miss out on the opportunity to meet with representatives from Palmeiras’ marketing department, take picture of the 2012 Brazil Cup trophy and chat with a former Palmeiras player! OK, let me spice that up a bit for your: come chat with none other than legendary keeper São Marcos! For more details, check out the flyer below or contact Louis Abe – Palmeiras’ representative in the US – at phuinha@gmail.com or 732-673-6982.